The Walt Disney Company has had a long love affair with trains going all the way back to Walt himself. The ones that encircle the Magic Kingdoms on both coasts are well known and loved. Most Disney fans have heard of the Carolwood Pacific train Walt had built in his back yard, much to his wife’s dismay. But from 1973 to 1980, there was another far less known Disney train that brings back a lot of fond memories for those who remember it. 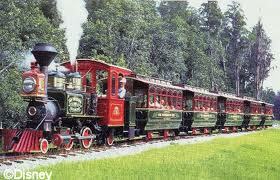 The Fort Wilderness Train was a steam train that wound it’s way for 3 1/2 miles around Fort Wilderness Campground. 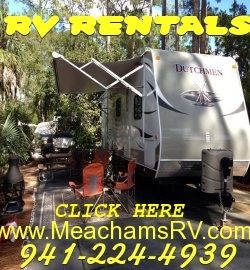 It transported guests and campers alike through beautiful stretches of Spanish moss laden pine trees, over trestles and past pristine waters on their way to their various campground loops, the camp stores, or just an enjoyable ride. 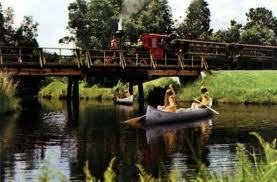 Before the Disney buses came on the scene, this was the way to travel Fort Wilderness. The train was a popular activity at the campground, and even today there are websites and youtube videos that show their devotion now, over 35 years after it’s close. Even those staying across the waters at The Contemporary Hotel and the Polynesian Village would often come and take the train’s scenic route through the Florida countryside. At twice the length of the Magic Kingdom‘s train tracks, it was a nice way to relax in the cool of the evening. If you know where to look, you can still find remnants of where the old rails passed through the countryside. At Walt Disney World, though, good ideas never completely die. After the railroad closed, it sat in disrepair for a while. Then, two of the coaches were pulled out and renovated to be ticket booths at Pleasure Island. One engine is reported to have gone to a Florida museum. At least one engine and car were adopted by the Carolwood Pacific Historical Society and restored. Today you can walk down past the Meadows trading Post, look out past the trestle bridge, and if you close your eyes and use a little imagination, you can still hear the old steam whistle blow. LIKE THE BLOG? SUBSCRIBE BY EMAIL, AND COME JOIN US BY LIKING OUR PAGE IN FACEBOOK!! Wow Rod, I didn’t know another train existed back then! Very interesting! Great read! Yeah Kyle, you can still find the places where the old tracks went. I used to love to ride this train around the campground. It’s still a favorite memory. I’ll have to drive over there & walk around sometime. I haven’t been at the campground there since we spent spring break there with some family one year about 10+ years ago. It looked like a very nice train ride! Two of the easy places to find are over by the Meadows Trading Post and behind loop 700. Happy hunting! As always, thanks! If you haven’t seem the old YouTube vids, you should check them out! Wow! I had no idea about this railroad. Very interesting! I want to look for the tracks now. I miss that train, We started going to WDW in 1975, everytime we made our reservations for the horse back riding trail we would always ride the train. My kids never got to ride it and I sure do miss it. Thanks! It was always one of our favorites!